Available now at the Blurb Bookstore. Our very own book of some of the best Context Free artwork from the first two and half years. All artwork has been re-generated at very high resolution (over 7 mega-pixel) for beautiful, full-page prints. Printed on demand on an HP Indigo 5000 press at (812dpi, hardcover) or a Xerox iGen3 (600dpi, softcover). 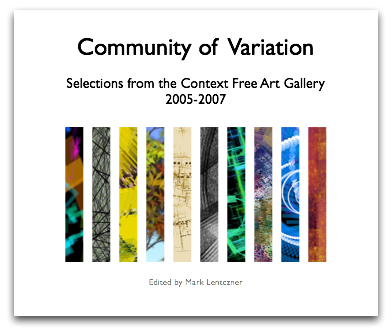 Community of Variation is a collection of works by 29 members of the Context Free Art community. It represents the wide range of artwork produced, and the people from around the globe that created it.